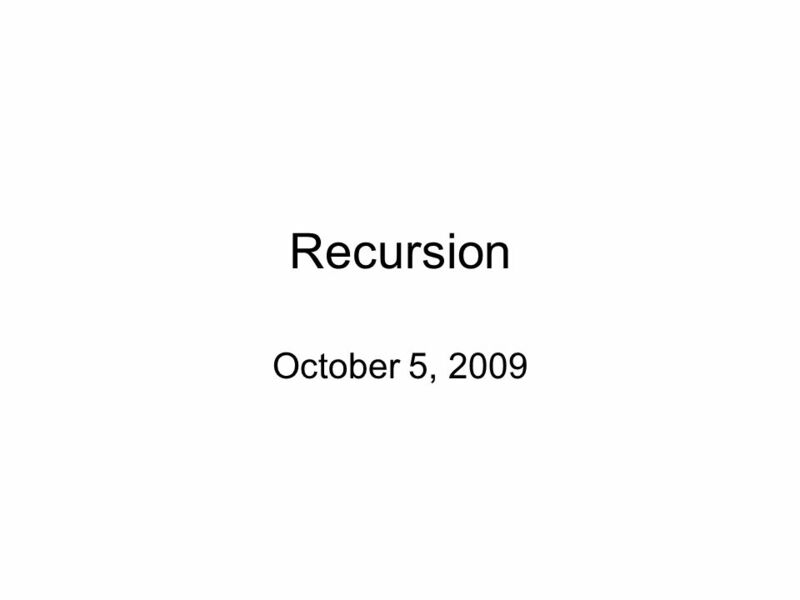 Recursion October 5, 2009. Reading Read pp 197-221 in the text. 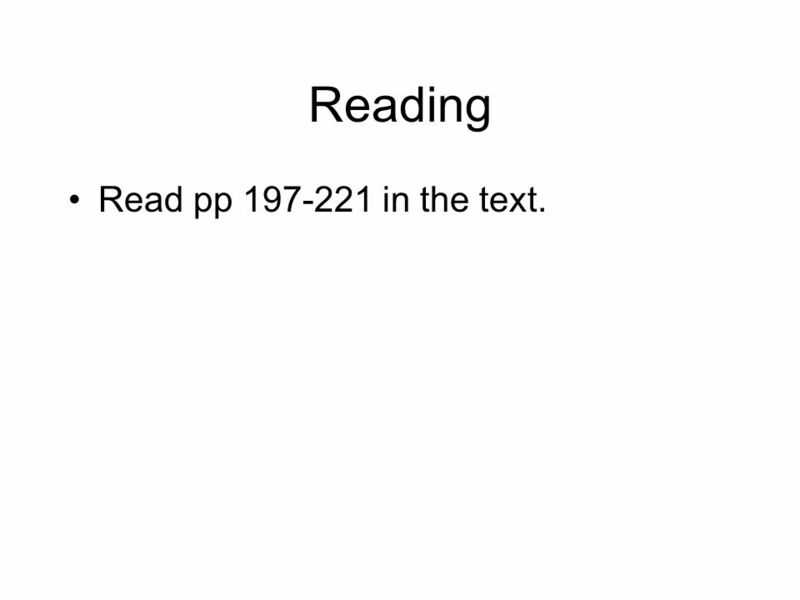 2 Reading Read pp 197-221 in the text. 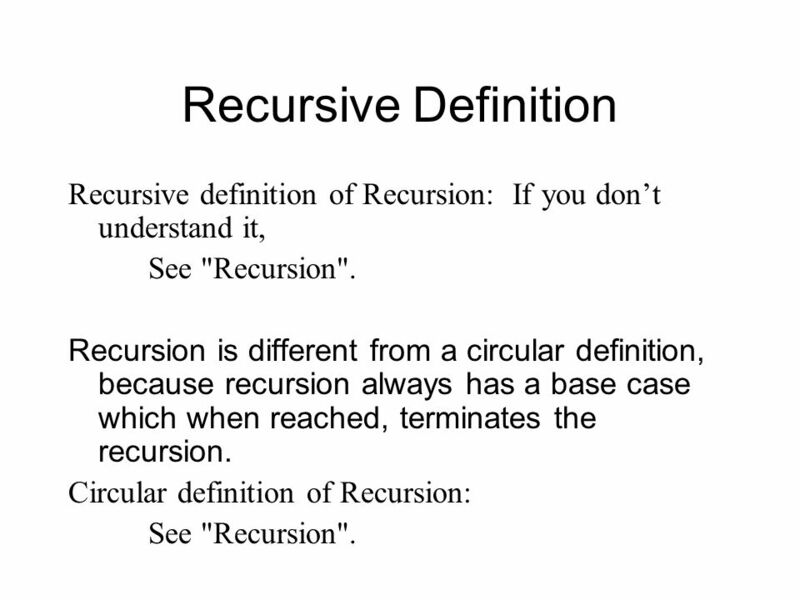 4 Recursive Definition Recursive definition of Recursion: If you don’t understand it, See "Recursion". 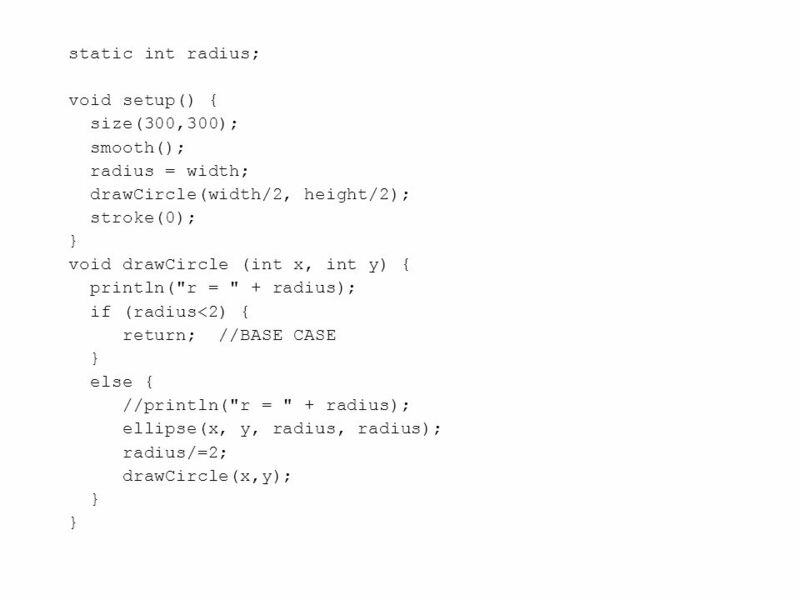 Recursion is different from a circular definition, because recursion always has a base case which when reached, terminates the recursion. Circular definition of Recursion: See "Recursion". 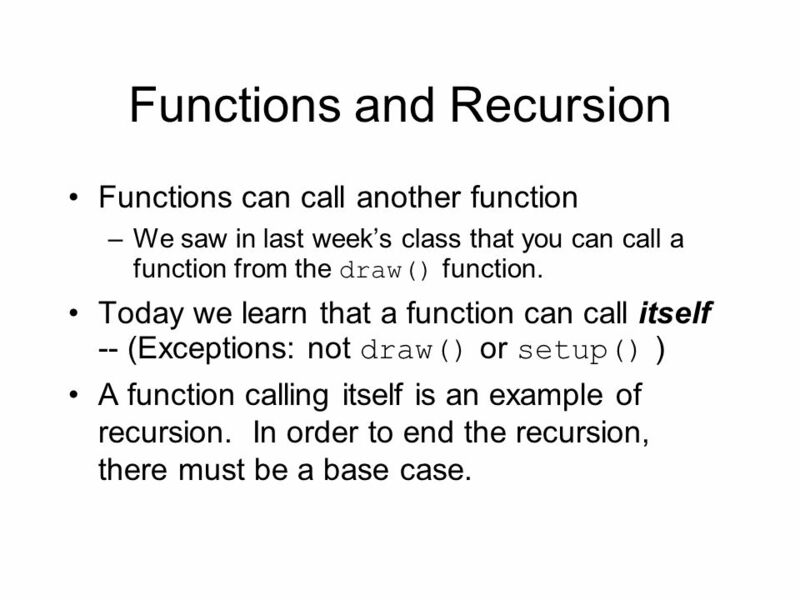 5 Functions and Recursion Functions can call another function –We saw in last week’s class that you can call a function from the draw() function. Today we learn that a function can call itself -- (Exceptions: not draw() or setup() ) A function calling itself is an example of recursion. 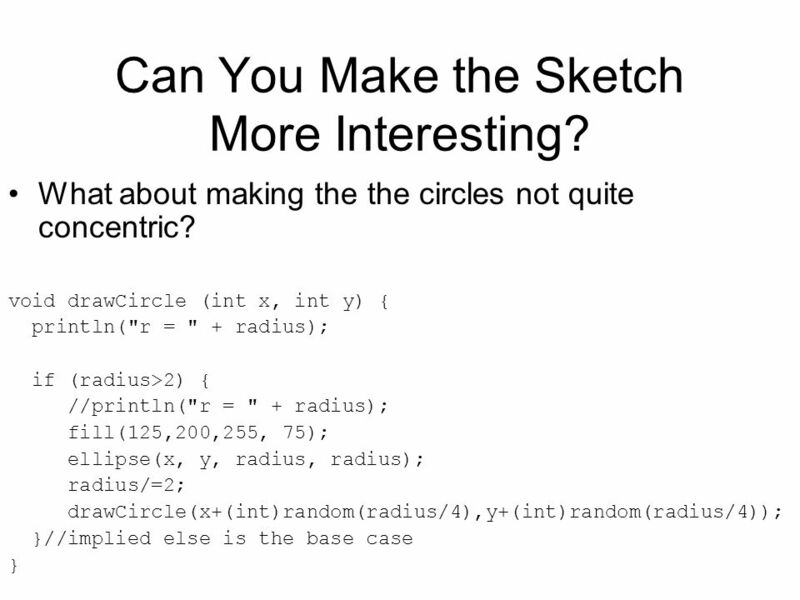 In order to end the recursion, there must be a base case. 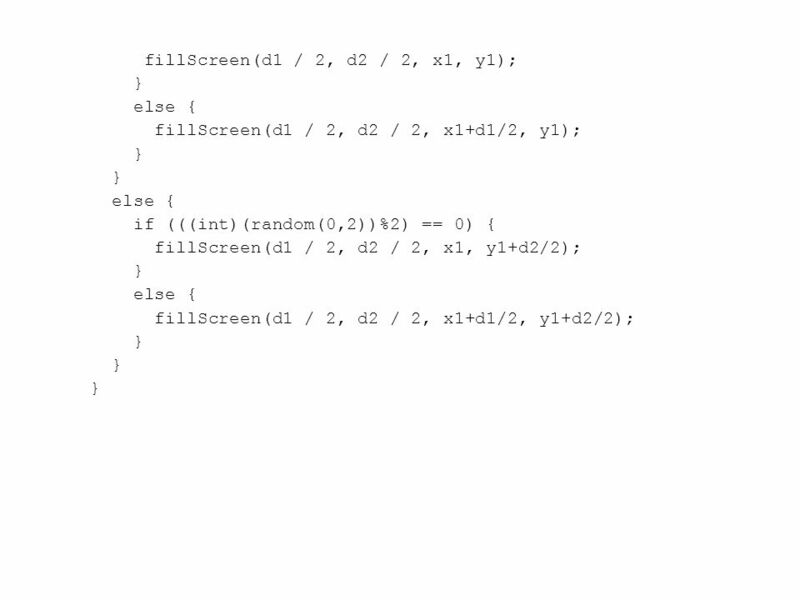 10 Recursion + Experimentation + Random = fun! 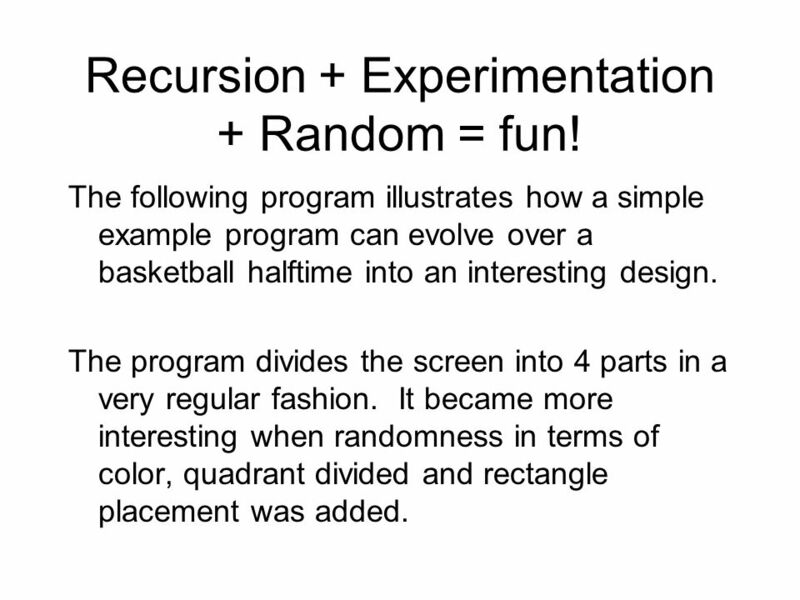 The following program illustrates how a simple example program can evolve over a basketball halftime into an interesting design. 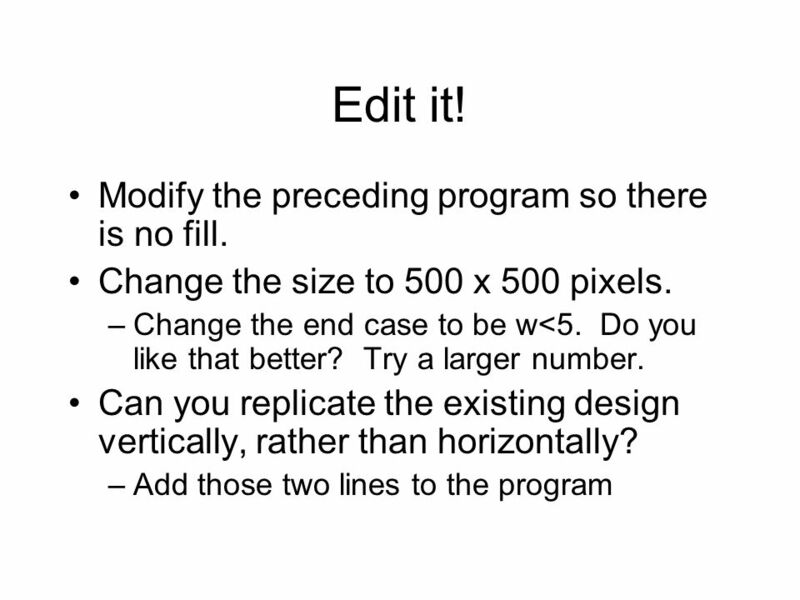 The program divides the screen into 4 parts in a very regular fashion. 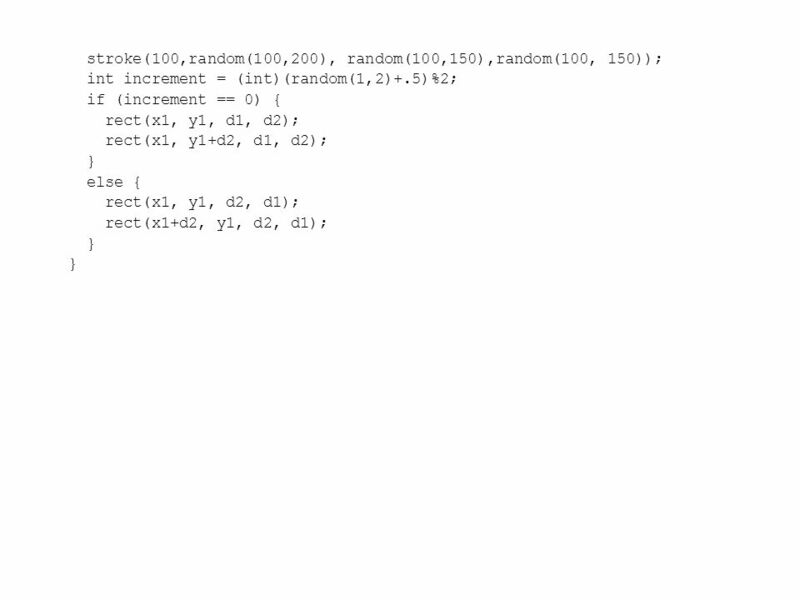 It became more interesting when randomness in terms of color, quadrant divided and rectangle placement was added. 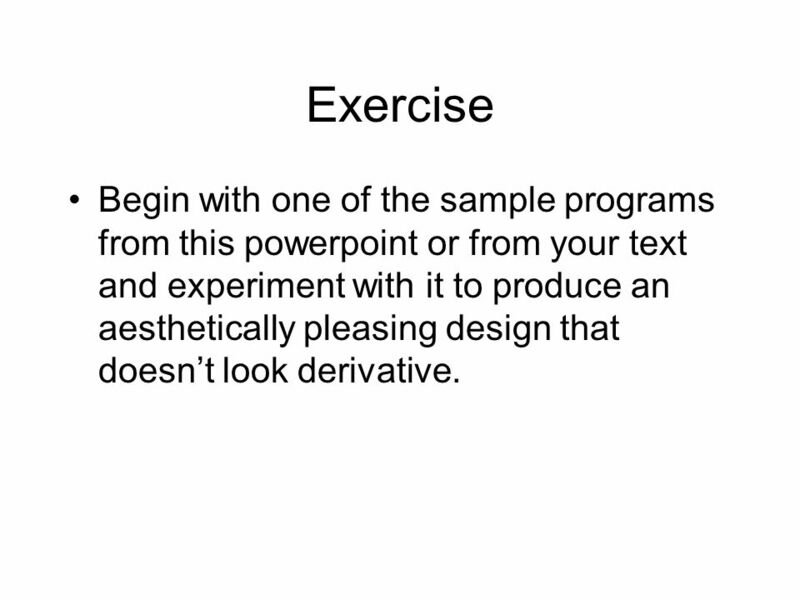 14 Exercise Begin with one of the sample programs from this powerpoint or from your text and experiment with it to produce an aesthetically pleasing design that doesn’t look derivative. 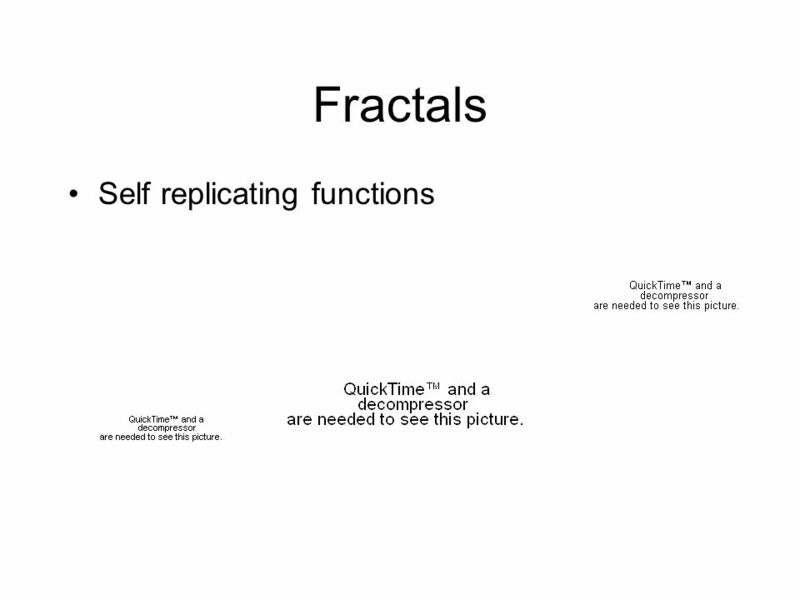 Download ppt "Recursion October 5, 2009. Reading Read pp 197-221 in the text." Introduction to Computer Science Robert Sedgewick and Kevin Wayne Copyright © Recursive GCD Demo public class. Polymorphism Method overriding Method overloading Dynamic binding 1.  Functions breakdown: Functions purpose Modularity Declaring and defining a function Calling a function Parameter passing Returning a value Reusability. Value is 1 Let x = FIBO(n-1)Let y = FIBO(n-2)x + y endbegin n > 2 n =1 or 2 RTN for Fibonacci numbers FIBO(n) begin Value is 1 Let y = FIBO(n-2)x + y. Image Processing … computing with and about data, … where "data" includes the values and relative locations of the colors that make up an image. Programming in Processing Taught by Ms. Madsen Assistants: Ms. Fischer and Ms. Yen Winsor School, 2/13/08. Game with US Beginner Tutorial. Welcome!! Who I am What is Processing? 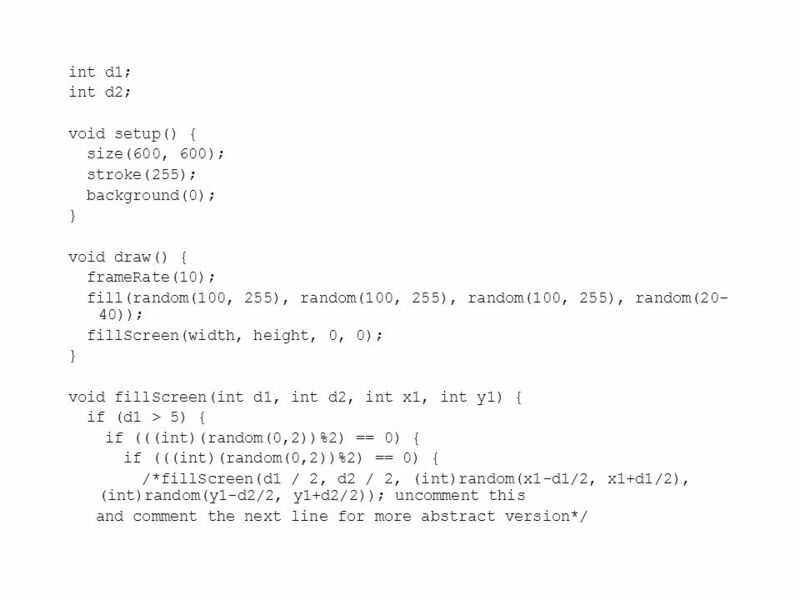 Basic Coding Input Methods Images Classes Arrays. 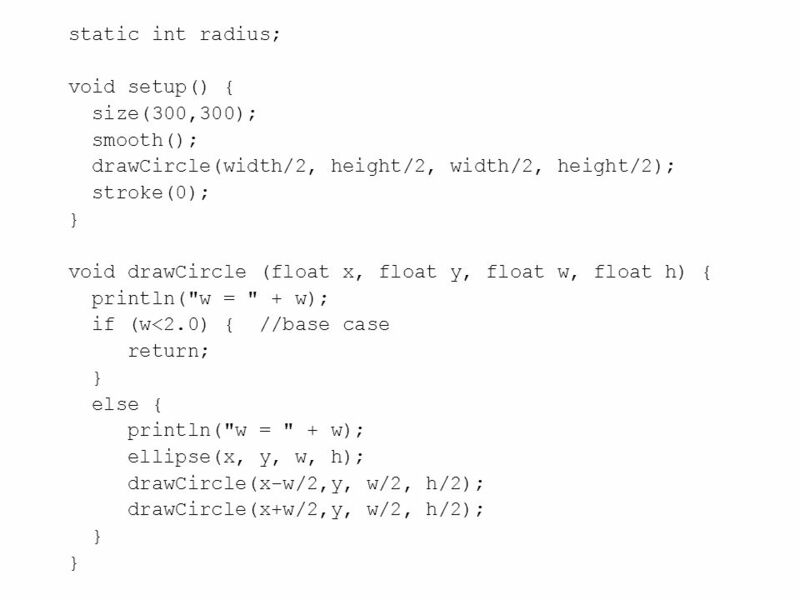 Code Elements and Processing Coordinate System. Code elements: pages Comments: are documentation notes that are ignored by the computer but are. Emerging Platform#5: Processing 2 B. Ramamurthy 6/13/2014B. Ramamurthy, CS6511.